This summer GeorgiaPeach (GP) was blessed to have two birthday parties! First, a small party at our home and then a family party back in the Land of Lincoln. I know! Sounds crazy to have two parties for a two-year old BUT, her very first birthday was a party of four (GP, the Coach, our dog, and a sad Mommy). I grew up in a very large and supportive family where birthdays, all sporting events, dance recitals, and concerts were celebrated, supported, and attended. If you had an event, someone in our family was there to support you. I wanted Georgia Peach to have similar memories of the “Family Birthday Party” with scores of her Aunties, Uncles, and Cousins so, we decided to travel to the love fest. Thanks, Coach! GP loves Elmo so, I made her Elmo’s face out of a platter of fruit. Now, I am NO Martha Stewart, I am more of the Pinterest Fail Kinda Mommy BUT, I will try. So when I made this for GP and it somewhat resembled Elmo I was excited! 🙂 But here is where I made my FIRST mistake… I finished my precious Elmo, put him on the table and began to finish up some last-minute items. As people started to arrive, I invited them to enjoy the food when I realized I forget to take a picture of Elmo! By the time I snapped the picture, he STILL looked like Elmo but, a little troubled in the mouth area (the blueberries were good!). 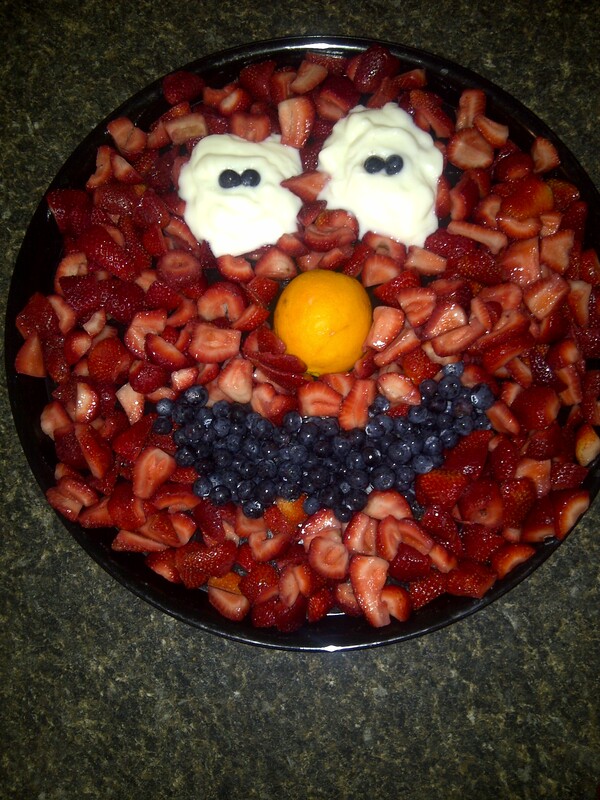 Nevertheless, the Elmo face was a hit and the Parents loved the fresh fruit and yogurt option. Anyone that truly knows me knows that I take my parties and party planning very seriously. From the invitations to the food, the favors to the music, the thank-you cards to the decor, I try to make sure it is all cohesive ( or at least cute!). An hour or so into the party, I started to panic a little when I thought we could possibly run out of pizza. We still had an extra-large left but, I was worried. How could this happen? Just when I was about to order another pizza and send the Coach out to pick it up, I mentioned to my Cousin LudaLike (Ha!) what I was about to do. LudaLike: What time did the party start? Me: 11A. It ends at 1P, I need to keep GP on her nap schedule. LudaLike: If someone shows up at this point and there is no pizza, don’t worry about it. Party started at 11A. Save your money. Me: Oh wise younger Cousin and experienced Father, I like it. Sounds like a plan. Turns out we didn’t even need an additional pizza. The remaining pizza was enough and we nibbled on it hours after the party ended. Whew! I didn’t let her blow out them out! I mean who wants toddler spit on their cupcakes, right? Apparently, everyone except me. When I say this was a BIG MISTAKE, I mean I may as well flipped the table in a fit of rage RHONJ style from the looks and comments I got! I thought I was going to get kicked out of my OWN child’s party for this move. In hindsight, I should have put the candles on her own cupcake and let her blow out the candles. Lesson learned. I feel like I get more nicknames in this blog then anyone of the other participants! But hey, I make or good writing material! Ha! You basically have one. But not to worry the others will be featured…very soon. 🙂 Thanks for reading. Next Next post: Oh Shirt!